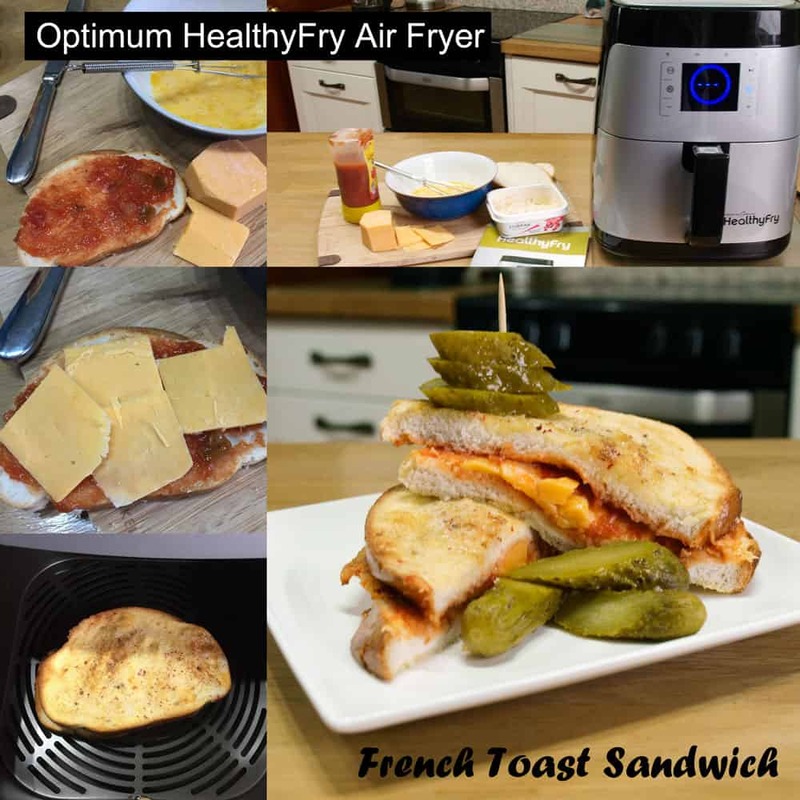 I’ve created this Air Fryer French Toast Sandwich to show the versatility of the Optimum HealthyFry Air Fryer. Too often Air Fryers are only used to make lower fat chips, while they are great at doing that, there is a lot more you can make in an Air Fryer. The Optimum HealthyFry Air Fryer features hot air circulation (Rapid Air), ingredients are heated evenly from all sides allowing you tsp prepare fried food with no oil, while still maintaining the taste and texture of conventional fried foods. I found the Optimum HealthyFry really easy to use, you preheat the air fryer by holding the power button for 3 seconds, then press the Start/pause button, once the 3 minutes preheating is up, pull out the drawer and place the food in the basket. Close the drawer then you can either use the preset programs or set the temperature and time just as you would with the oven. The Optimum HealthyFry Air Fryer is currently on SALE for £129 (Save £70) and as I’m a Froothie Ambassador and during #Jumpstart17 (January and February 2017) you get free delivery in the UK! Just you use my ambassador link to order your HealthyFry Air Fryer simply type “3116” and “free ambassador delivery” in the comment section of the order. Delivery will be credited back to your card. I don’t know about you, but round about the end of January my motivation to eat healthily tends to waver. I long for something crisp, something fried. Well, this year you can have fried food with the Optimum HealthyFry Air Fryer, it’s a professional-quality Air Fryer which allows you to fry, roast and grill with no oil, you can even bake in it too! 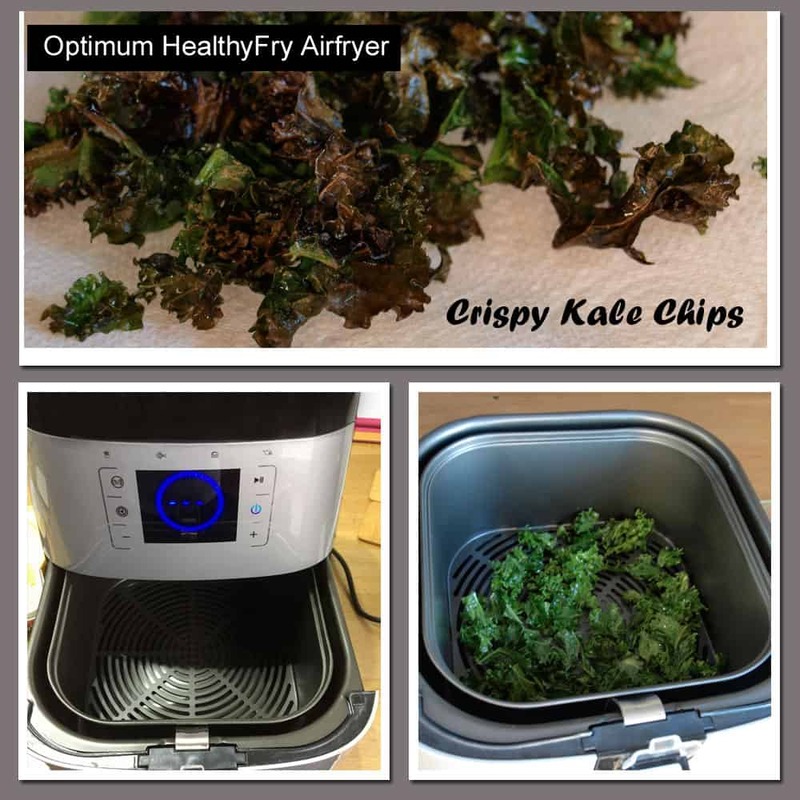 My first trial of the Optimum HealthyFry Air Fryer was to make some kale chips. You don’t need much kale to make a bowl of kale chips for snacking or to include in a salad or to garnish a main meal. Once the preheating time has passed, open the drawer and add the kale to the basket. Close the drawer and set the heat to 160C and cook for 4 minutes. Open the drawer and toss the kale around then bake again for a further 3-4 minutes. Once cooked, empty the kale chips from the basket onto kitchen paper to drain, then transfer to a bowl to serve. You can open the drawer to check on what you are ‘frying’ without a problem, just press pause, then restart once you have checked on the cooking. 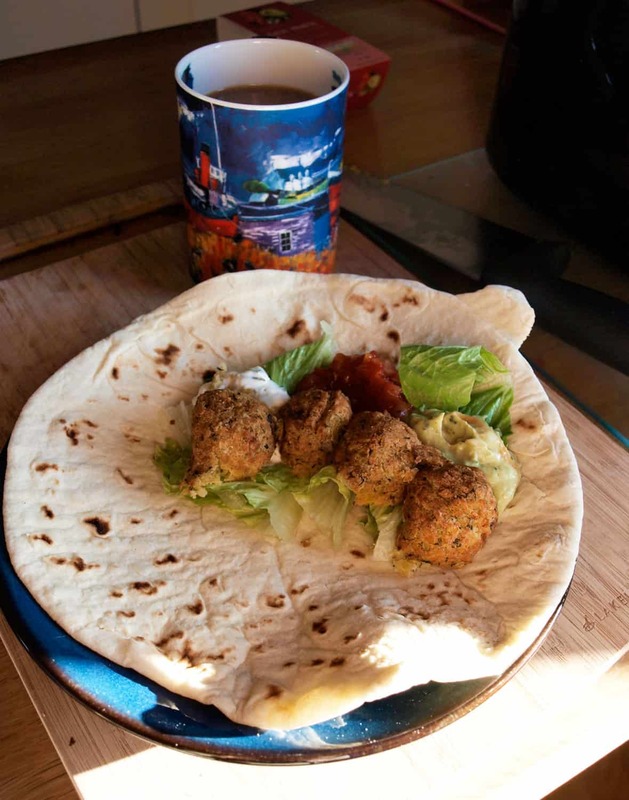 My second trial involved some ready-made falafel bought in the supermarket. I followed the directions on the packet, replicating the temperature and timing on the HealthyFry. They turned out perfectly, piping hot and I didn’t need to heat up the whole oven just for a few falafels for lunch. You could even heat the wraps in a minute in the HealthyFry. Finally, I thought I’d try something which I would normally shallow fry, a French Toast Sandwich. It’s a combination of French Toast and a toasted sandwich all cooked in the Optimum HealthyFy Air Fryer. 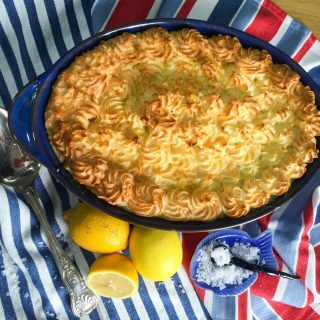 I’m pleased to say that it worked really well with crispy eggy toast and a melted cheesy filling, I’d definitely make this again. A tasty French Toast Sandwich made in the Optimum HealthyFry Air fryer cooked without oil. Cook at 350 C for 4 minutes. Serve with gherkins if liked. The Optimum HealthyFry Air Fryer is the ultimate appliance for preparing health-conscious meals. Its versatile functions allow you to fry, grill, roast or bake a variety of dishes with pressure-cooking technology, also known as Rapid Air. The HealthyFry is simple to use and the benefits include a tasty, nutritious meal each and every time! The HealthyFry Rapid Air pressure-cooking technology seals in the natural juices from the food, allowing you to use less oil to get that fried food taste without the fried calories. The HealthyFry Air Fryer heats food from all sides providing more even heat distribution and speedier cooking. Your meals will be done quicker and tastier, saving you time and your kitchen’s energy without compromising quality. 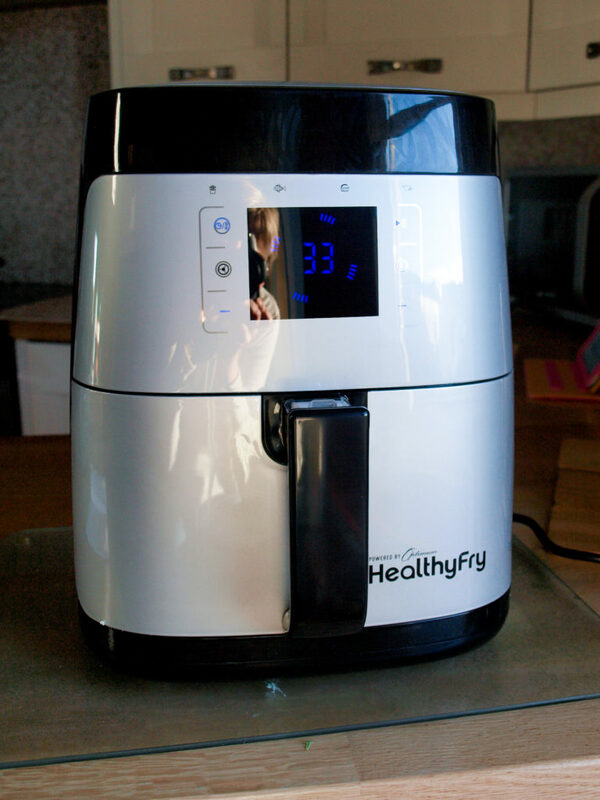 Pressure frying food in the HealthyFry is safer than using a conventional deep fryer. The Rapid Air technology allows food to be fried evenly at a lower temperature. The Optimum HealthyFry Air Fryer will save you ingredients, time and energy all while producing a high quality, healthier meal for you and your friends and family to enjoy. With apologies for the reflection! Disclosure: Froothie UK sent me the Optimum HealthyFry Air Fyer to use and review at home. 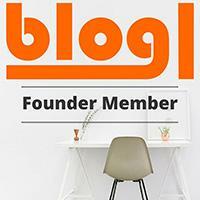 I have not been paid for this post and was not required to give the HealthyFry a positive write-up. All opinions are my own. Affiliate links included in this post, buying through a link will not cost you any more, but I will get a small commission. 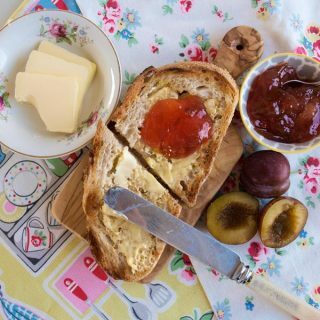 This helps keep Farmersgirl Kitchen website online providing recipes and reviews for you. Love how versatile the HealthyFry is and that sandwich has made me hungry; it looks delicious! Some great ideas. I love the toastie idea and I was thinking about trying fresh falafel in it too. It’s a great price for such an easy to use and versatile machine. So many things still to try, Jac. I think the HealthyFry will be well used in this house! I have an air-fryer too and love using it! I’ve tried many things (such as meatballs and fries) but never gave kale chips a go. Can’t wait to try them! It’s fun to experiment isn’t it? Such a versatile machine. 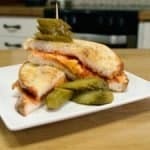 I would never have thought of using an air fryer to make a toasted sandwich – what a neat idea! Some great and varied ideas for using the healthyfry, very intrigued by the french toast sandwich in particular. Thanks for the review of the key features of the appliance too! Thanks Kavey. I thought the sandwich was a no-brainer, but seems not! It really ‘fries-up’ nice and toasty. When I saw the kale chips, I was going to say how much healthier your chip recipe was than mine – then I saw the French toast sandwich 😉 What a fab idea. Great review too. So many things you can do with the HealthyFry! Love the french toast sandwich idea and the kale chips – yum! Yes, I’m only just starting to exploit the potential! Wow a fried sandwich – I would never have thought to try that. Can’t wait to give it a go! 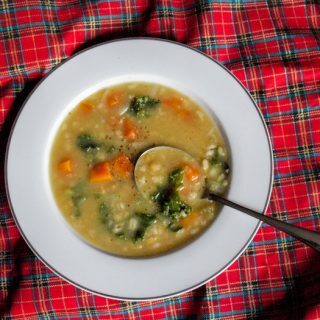 Have yummed and pinned the recipes! 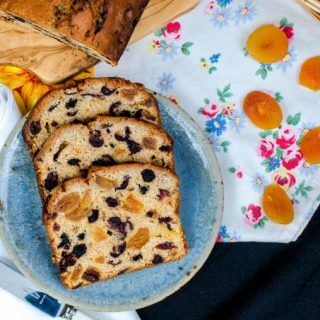 Oooh – I regularly leave my kale chips in the oven just a touch too long because I wander off during the process – this looks like a much more reliable way to get them right! Sounds delicious! Great way of using the fryer 🙂 and I love crispy kale! Thanks, yes crispy kale is so good. Im not going to lie when it comes to kitchen gadgets I tend to use them for just a handful of recipes and then get bored. Healthy fryer? I’d instantly make chips!!! But this is such a clever way of using it I would never have come up with myself! Ha! Some kitchen gadgets are like that, but the HealthyFry is so easy to use, it’s quite inspiring! A grilled sandwich in the air fryer? Genius, I’ve got to try this! 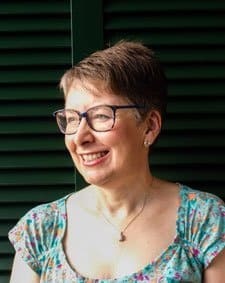 Thanks Cathy, it is worth making! sounds delicious. You are very talented.